We’ve all had that burning desire: shirk adult responsibilities and grab a backpack, head to the nearest airport for a plane bound for anywhere else. Travel from country to country by train, rail, or car; experience the rest of the world by the skin of your teeth not knowing where you’ll end up tomorrow. 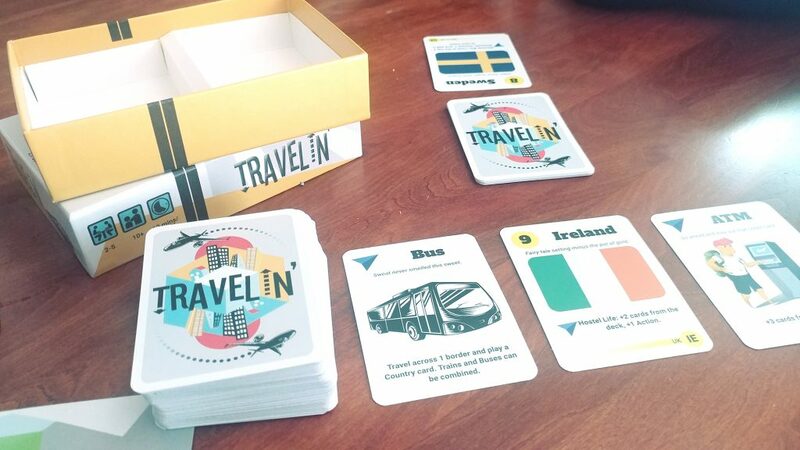 Time, money, and reality make this an unlikely proposition for most of us, but with ‘Travelin’ you can grab a friend (or 4), shuffle up, and deal the world! Remember when you were a kid, and you played Milles Bornes at your grandparents’ with your brother til 2am when you visited? Ok, maybe that was just me. But this game plays like MIlles Bornes. A lot, actually. This feels like a loving homage to that game with a backpacking theme and some variations on Action cards. This is by no means a bad thing, as why reinvent the wheel if you want to have a good time. Each player is dealt 8 cards, and 3 common cards are put on the table face up. In your hand, you look for a Country card which will become your Starting Travel Point (the odds are you will be dealt at least one, but if not you discard your hand and are dealt another).. Every player places this face down, until everyone else has chosen their respective STP (acronyms!) You reveal your country card, and the player with the lowest score (the number in the upper right hand corner of your card) gets to go first. Once the setup and starting player have been selected, you jump into the game. Players will draw one of the 3 cards that were laid out at setup, the top card from the discard deck (this doesn’t apply to the first player unless someone discarded their initial hand because they didn’t have a country card) or 2 cards from the deck. This is pretty straightforward, but one of my issues with this game is there is no set hand maximum (or minimum) so the choice to take 1 or 2 cards has little weight. You aren’t concerned with hand management, which isn’t a bad thing, but as the game progresses your hand may become a tad unwieldy. After you draw you take an action. 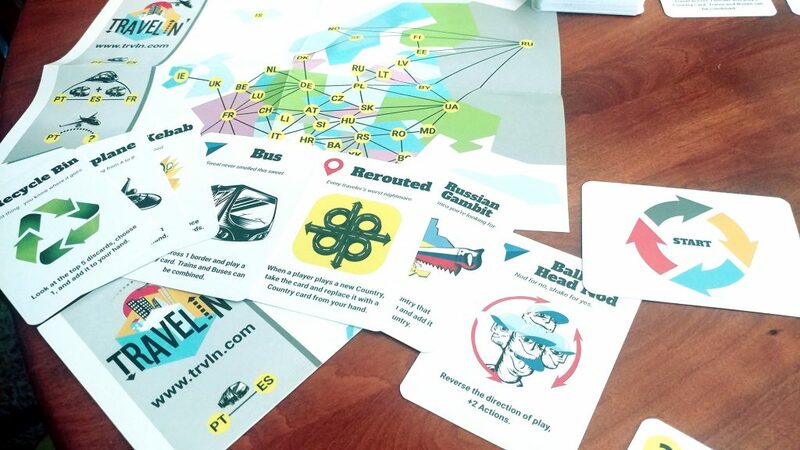 These cards come in a variety of flavors: Country, the destination you’re trying to get to; Action, something that helps move you along to your destination such as Train, Bus, or Taxi; and Special, the cards that can thwart your fellow travellers by placing Travel Restrictions or Rerouting them to a country far from where they are. 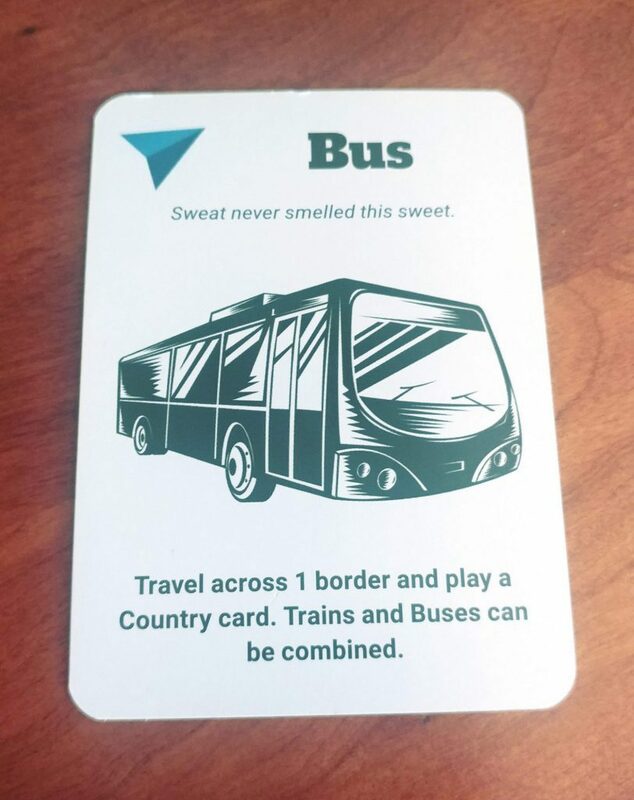 Some of these cards have the ability to modify or create new rules, such as the ability to take extra Actions when you travel to a Country that allows increased actions (Picture) This is pleasantly reminiscent of Fluxx, changing the nature of the game as you play. Whereas in other games, the types of Counters and Special cards are at least outlined, these are not as carefully defined so there’s really no way to prepare or strategize for them without at least playing a good few times. Those cards are so few and far between, it is also likely you may not encounter them for a good couple of play sessions. None of this is to say when the game gets going, it isn’t enjoyable. If you let go of your notions (or at least me let go of mine) and just play as the game unfolds, it can become quite entertaining with the everchanging game play. The game ends when 5 country cards have been played Tally up the numbers on the country cards in front of each player, the player with the highest score is the winner. This is a delightfully simple but elegant way to determine the winner. This was a quick and fun game to learn and play in a short period of time, and while I did experience some resistance in the first few plays, as I got accustomed to the nature and variety of the Country and other action cards, the flow begins to make more sense. The rule-book is light, and a game of this weight doesn’t necessarily need a lengthy book to clarify its rules, I do wish there had been some more clarity in terms of how the Country cards and other Actions were played. Even a glossary of the cards and an explanation of their actions would have been of significant benefit. Despite these minor faults, this is an enjoyable game that will take no more than 20-30 minutes with 2-5 players, and as mentioned before is a loving tribute to Milles Bornes and the genre of travel-themed games.